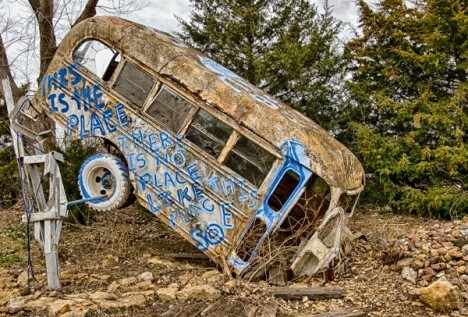 The legendary Cadillac Ranch can’t be beat but it CAN be copied! 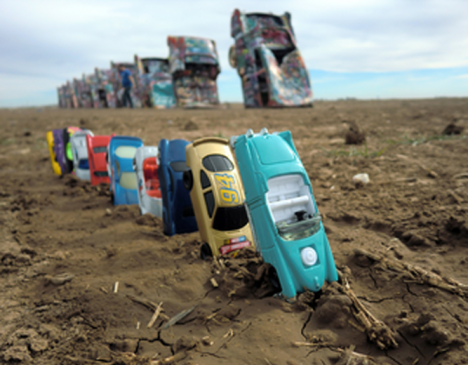 These 12 tinny tributes to Amarillo’s angled auto art shift flattery into high gear. Cadillacs may be iconic symbols of those Fabulous Fifties but by the time the Space Age was in full flight, pop culture had ditched finned land barges in favor of “lowly” but well-loved VW Beetles. 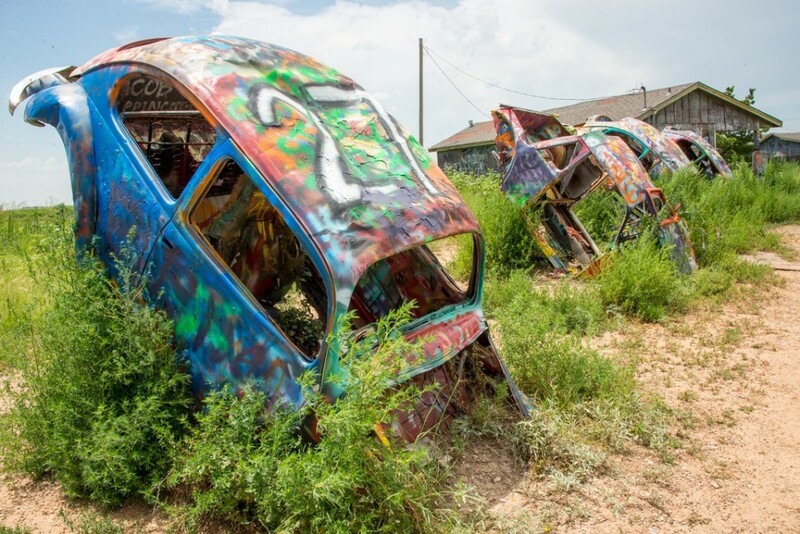 A half-century later, classic Bugs are a rare sight on America’s roads though you’ll find plenty at the Slug Bug Ranch in Conway, Texas! 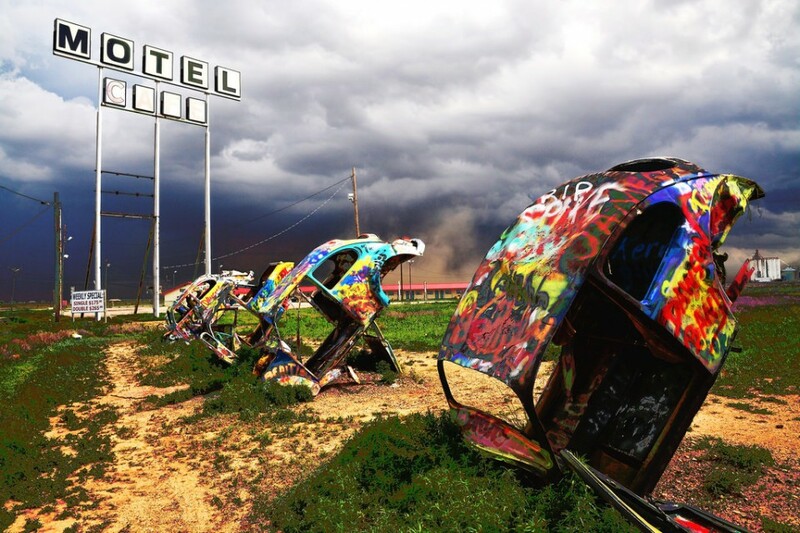 Kudos to Flickr users Jenny McG (thedefiningmoment), Kent Kanouse (Snap Man) and The Atomic Kid 1959 for bringing out the best in the Bug Ranch’s buried but be-dazzled Beetles! 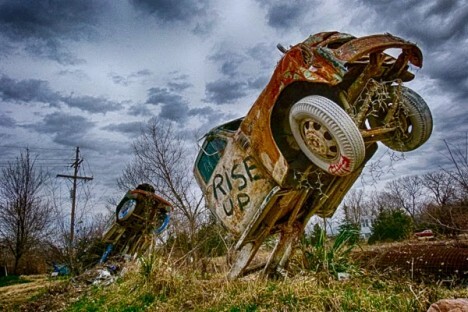 Lumping Ron Lessman’s varied automotive artworks into a “truckhenge” is rather all-inclusive – the Shawnee County, Kansas denizen has deployed a host of land and water craft in several distinct henges. 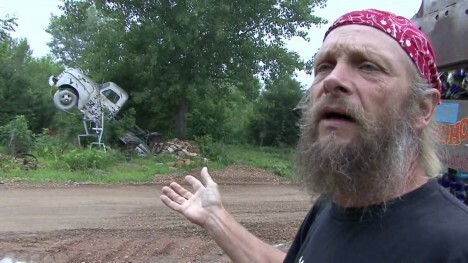 According to The Vagabond Glovers’ Meanderings, “Shawnee County health and zoning officials got after him to clean up his yard, and when they told him to pick up his trucks, he decided to take their orders literally, and pick them up, then plant them back down in the ground the way he saw it done in Texas at Cadillac Ranch.” That’s tellin’ ’em, Ron! Old and busted: car smashups. New hotness: Toy Mashups, which just happens to be where photographers Josh Cornish and Kyle Hillery snapped the above installation and its inspiration in May of 2012. 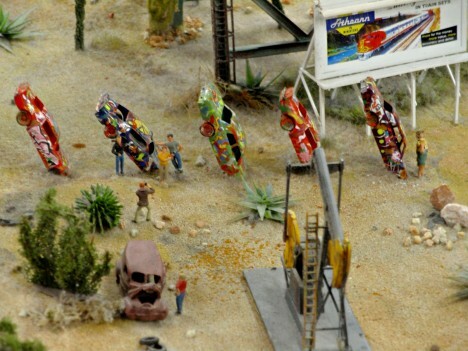 Unlike the original Cadillac Ranch created by art collective Ant Farm (Chip Lord, Hudson Marquez and Doug Michels) and eclectic landowner Stanley Marsh 3 back in 1974, no backhoes were required to set the miniatures in place. Well, maybe a teeny tiny toy backhoe. 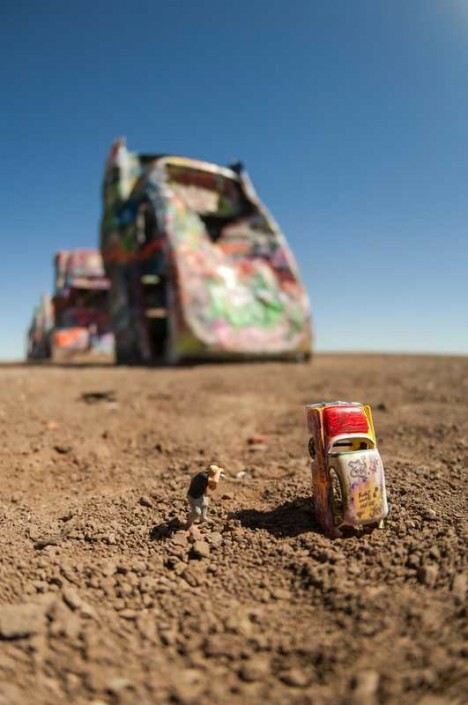 Nice that both Miniatur Wunderland (c/o Knitrageous) in Hamburg, Germany and Un Petit Monde saw fit to apply graffiti to their scaled-down Cadillac Ranch tributes. It’s doubtful visitors to these installations will be allowed to personalize them, though. Wow, Christine has really let herself go! 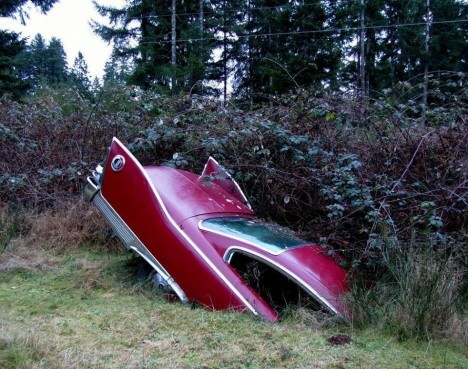 Actually this is/was a 1960 Plymouth Fury while King’s krazed killer kar was a ’58 model. 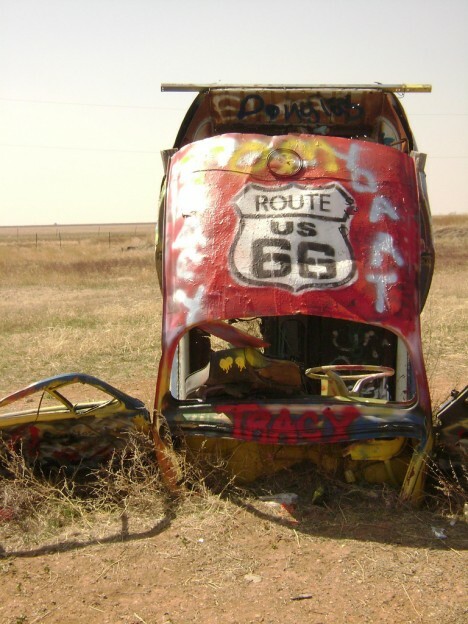 We’re not certain whether the vehicle’s owner had Cadillac Ranch in mind when he tilted this seemingly sharp Oldie But Goodie into its diagonal semi-grave but the finned beauty sure could use some company.